This is stolen from our friend’s status update on Facebook and it made us titter. He lives in the UK! However, the semi-arrival of summer in the UK (we know it’s intermittent, at best), and a few people subsequently asking us about our favourite Turkish meze recipes for barbecues, have prompted us to compile this short list. Each of these recipes, plus more besides, is already on the blog. But these are five of our favourites that just sit well on the barbecue table. If you know us, you will not be one bit surprised to see Antep Ezmesi in this list. The thing is, you are inviting friends over for a barbecue and you’re going to the trouble of making a Turkish meze dish from scratch. We’ve never met anyone who doesn’t love Antep Ezmesi. It’s refreshing, packed full of summer salad stuffs and it can be as spicy as you want it to be. If we were forced to choose, this could be an all-time favourite for us. It’s worth the effort! 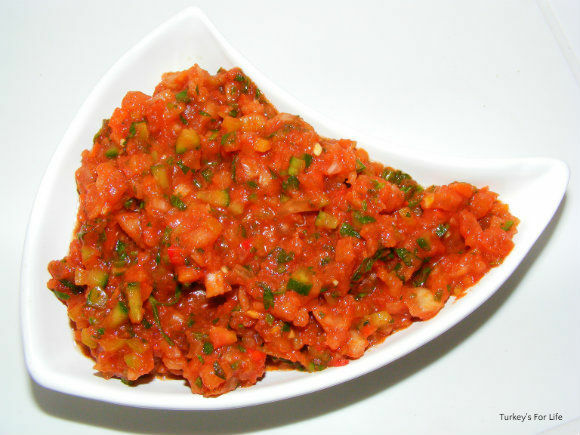 Click this link to view our Antep Ezmesi recipe. Well, you can’t have a Turkish-themed barbecue and not have cacık on the menu. Natural yoghurt is a staple of Turkish cuisine. You will see many meze recipes that have yoghurt as the base. Cacık, with its optional garlic, is probably the most famous of these mezes. As well as being really tasty, is also a great aid to digestion. Well, you don’t want to be sending your barbecue guests home with indigestion, do you? Click this link if you would like to follow our recipe for cacık. 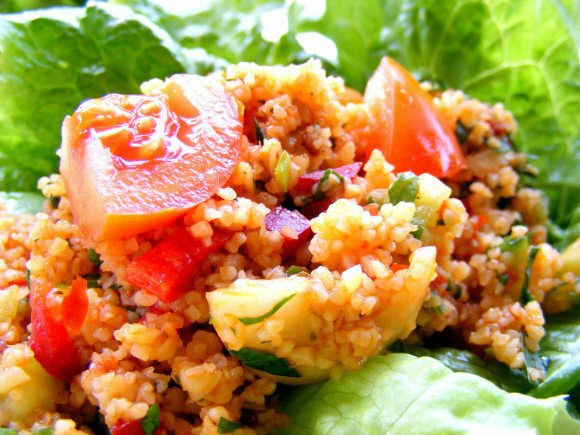 Put a spoonful of kısır onto a lettuce leaf, wrap and eat. Yummy! Oh, how we love kısır. Actually, it was this dish that also helped along with the decision to do this post. You see, summer in Fethiye is a given. 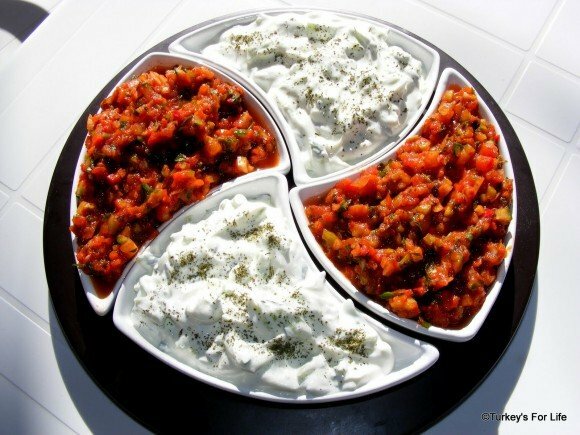 The effect on the appetite is that we crave the grazing on light meze dishes rather than ploughing through heavy meals. We make kısır just so we can eat it for lunch with crispy lettuce leaves. Nar ekşisi (Pomegranate syrup) is a must-add ingredient for us. But, if you’re not in Turkey and you can’t get hold of any, lemon juice is a good substitute. Perfect with grilled meats! To add this dish to your barbecue table, click this link to follow our kısır meze recipe. That’s Aubergine (Eggplant) Salad to the non-Turkish speaker. Turkey and aubergines are best friends and aubergine (or eggplant) features heavily in Turkish cuisine. It would be a shame to have a barbecue that didn’t acknowledge the Turkish love of the aubergine. This Turkish meze is definitely one of our favourites. 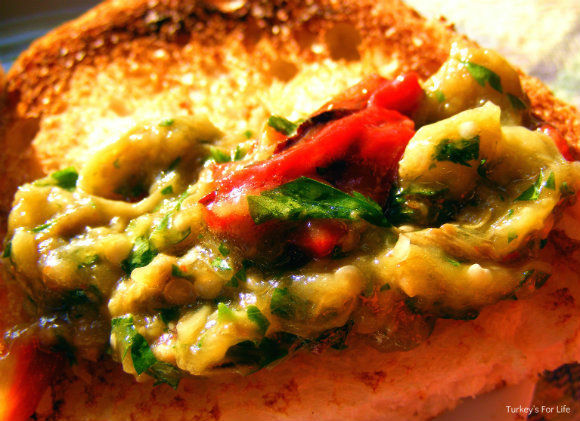 It goes really well with grilled meats and is nothing short of yummy when dolloped onto toasted bread. If you’re a garlic fiend like us, rub a raw garlic clove over your toast first. To make this Turkish meze, follow our recipe for aubergine salad. Well, what’s a barbecue without the presence of piyaz? That’s what we think, anyway. Anyone who comes to our house will definitely see a huge bowl of this amongst the other meze dishes. Aside from the fact that we just love piyaz, it is just the most perfect accompaniment to köfte (meatballs). More often than not, there will be köfte present at our barbecues. Piyaz usually has a dressing of vinegar, lemon and olive oil. But Antalya Usulü Piyazı has the extra addition of tahin (tahini or sesame seed paste) mixed into the dressing. You can leave this out if it isn’t to your taste, but we highly recommend trying it. We’ve eaten a lot of piyaz recently and have used tinned beans just for quickness. They work! To give your guests the perfect accompaniment to their barbecued köfte, click this link for our Antalya Usulü Piyazı recipe. 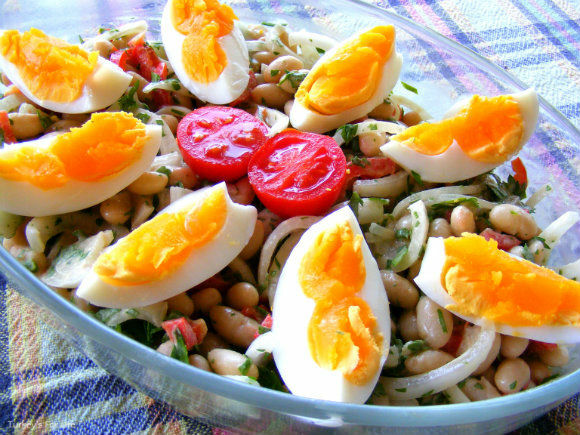 The great thing with all these Turkish meze dishes is that, apart from the hard-boiled egg which garnishes the piyaz, they can all be made the night before your barbecue. Just remember to lift them out of the fridge a couple of hours before you eat and give them all a stir. Of course, the abundant presence of meze is also going to mean your vegetarian friends won’t be going home from your barbecue with a rumbling tummy! There are lots of other vegetarian Turkish foods, too, and, if you’ve got extra time on your hands, you could always make some classic Turkish phyllo rolls for your guests, too. Turkish Food – Pickles. It’s official…They’re good for you! Yum, yum and yum again. Give me those five, some good bread and some bits of dead sheep on a stick, and I’m in heaven. What a fab summery foodie post – and with recipes, too, some of which even seem quite easy! Else, I could easily agree with your friend’s status update. Summer up here has been only for a few days as well – in May! yum! i love all of these and will be making them again soon. i am on the hunt for pomegranate molasses. i bet i can find it around here. Excellent choices – though I miss sigara börek and Imam bayildi.